First, if you’re going to carry a compact pistol then that’s what you should train and practice with. Attending training and practicing with a full size pistol is good for learning the fundamentals. The larger pistol is easier to manipulate and shoot accurately. This is fine for the beginning. Once you decide to carry a smaller pistol then that’s what you should focus on, working with it almost exclusively so everything is consistent with what and how you carry. The smaller the pistol the more difficult it can be to manipulate. Larger hands and small pistols can be a difficult combination. For example a lot of compact handguns have a thumb safety, just like their bigger brothers. The problem is that the safety is small, in proportion to the size of the frame. A miniature thumb safety is difficult to operate already due to its size. Add larger hands into the mix and it can become almost impossible. None of my compact pistols have thumb safeties. If I did have one with the small safety I would try to fabricate up a larger safety for it. Compacts have shorter grips and magazines. This requires you to develop some specialize techniques for inserting and removing the magazine. 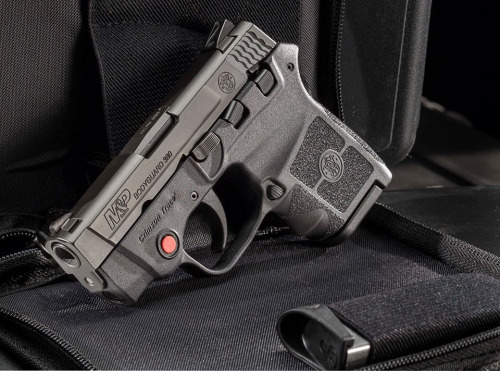 Normally the grip and magwell will not extend past or below your fingertips. When inserting a fresh mag, to load or reload, it’s usually necessary to do a high-tea kind of thing and get most of the fingers of the strong hand out of the way so the mag can be inserted and locked into the pistol without fingers getting in the way. The same is true when removing the mag, for example when reloading. The fingers and heel of the hand are usually in contact with the magazine, especially if the mag has extended base plates to increase capacity. When the mag release is pressed the hand/fingers are in contact with the mag. It will release, but probably won’t drop free. The solution is to use the support hand to strip the mag out of the grip as the hand goes for the new mag. Usually we use a “C” clamp grip to cycle the slide, grabbing the slide between the heel of the hand and the fingertips. With a smaller pistol it may be necessary to use the “sling-shot” method, pinching the slide between the thumb and first finger of the support hand. Regardless of how your cycle the action make sure the ejection port isn’t covered or blocked by the hand/fingers. This can quickly turn a Type I or II malfunction into a Type III stoppage. Should You Open Carry Or Go Concealed?